Dr. Brian Wladkowski has been teaching chemistry at McDaniel College since 1995, and has taught nearly every course offered by the Chemistry Department from introductory courses to advanced physical chemistry courses. Dr. Wladkowski also developed the popular Forensic Science program at McDaniel nearly ten years ago and teaches the introductory course in that program. Outside of chemistry, Dr. Wladkowski also teaches a fishing class in the Florida Keys and takes students scuba diving around the world as part of a course offered during January Term. Dr. Wladkowski has had many areas of research interest over the years including computational modeling of enzyme active site and the study of various types of spectroscopy in chemical applications. Most recently, he and his undergraduate research students have been interested in alternative energy research, specifically Bio-diesel processing. The long-term goal of this most recent project is to develop a processor that will convert used cooking oil produced by McDaniel's cafeteria into usable fuel for campus vehicles. Dr. Marx has been a physics professor at McDaniel College since 2000 and enjoys teaching classes at all levels, from general science courses, such as Astronomy and The Nature of Science, up through senior-level Quantum Mechanics. Outside of the Physics Department, Dr. Marx also teaches backpacking, juggling, and a tropical marine biology trip in the Bahamas. In 2004, Dr. Marx was awarded the Ira G. Zepp Distinguished Teaching Award, which is the highest honor McDaniel College bestows on its faculty. Dr. Marx’s research centers on two areas: pedagogy and theoretical modeling. His pedagogy research focuses on improving how students learn physics, and he is the author of many peer-reviewed publications on developing students’ problem-solving abilities, shifting their attitudes about science, and understanding students’ fundamental misconceptions about physical concepts. He is currently co-authoring a calculus-based physics textbook for introductory undergraduate physics to be published by Wiley. On his other research front, Dr. Marx works closely with undergraduate science students developing comprehensive theoretical models of intriguing physical systems. Some recent examples include determining the optimal grip on a lacrosse stick for an overhand throw, detailing the interaction and paths of two orbit-swapping moons circling Saturn, and characterizing and constructing a wireless power transmission system. Computer Science, Physics, and Sociology Departments. She has a bachelor’s degree in Studio Art & Art History with a minor in Accounting, and a Master’s degree in Human Resources Development. Kathy has worked at McDaniel College for 21 years. She enjoys working with students and being a part of the difference that college makes in their lives. In her free time, Kathy enjoys being with her family, reading, making scrapbooks, and watching her children play basketball and volleyball. Dr. Arnal joined McDaniel College in 2009 as a specialist in cognitive psychology and psychological methods and statistics. Outside of psychology, Dr. Arnal has also taught interdisciplinary courses about the science behind zombies and pranking as a form communication/information processing. He will also be teaching a first year seminar on Doctor Who and metacognition in the Fall. Dr. Arnal is a cognitive psychologist with special interest in human memory processes and metacognition. He collaborates with students in his Cognitive Psychology and Psychology Method and Statistics courses on studies of false memory and prospective memory. He is particularly interested in memory used in forensic settings, such as the prospective memory of eyewitnesses and whether they remember to contact the authorities when a suspect is spotted. Dr. Staab joined the faculty of the McDaniel College Biology Department in 2013. She is the resident vertebrate morphologist and teaches upper level courses like Comparative Anatomy of the Vertebrates and Animal Physiology as well as introductory courses like Animals as Machines (biomechanics) and a First-Year Seminar course called Tinkering with Discovery. She completed her doctorate and postdoctoral work at The George Washington University prior to joining McDaniel. Her research focus has always been fish morphology and in addition to exploring the massive fish collection at the Smithsonian National Museum of Natural History, her scientific investigations have also taken her to several marine labs from Puget Sound to the California Coast. Dr. Staab has most recently worked on a lab on a brigantine ship while sailing in the Caribbean, in collaboration with the SEA Semester study abroad program. Her particular research focus is how fish use the anatomy that they have to function in an aquatic world that is much denser and more viscous than life on land. Dr. Staab’s research students use histological techniques to look at the bones, muscles, and cartilage in fish heads, which have evolved to function much like a turkey baster during suction feeding. Her engaging teaching and collaborative research training techniques have recently earned her the Charles A. Boehlke Engaged Faculty Fellow award, which rewards faculty for exceptional records of student mentorship and support for experiential learning. Dr. Craig is a New Zealand American. He has been teaching since 2001, starting at the The College of Idaho for five years and then at McDaniel College after that. He teaches Analytical, Inorganic, and Introductory Chemistry, a Food Chemistry First Year Seminar, and does research with students on heavy-metal chelating agents and metal complexes designed to function as antibacterial, anticancer or antiviral agents. Outside College, he has given chemistry demos at Celebree daycare and West Middle School. My name is Anthony, and I am a rising Senior studying Physics, with a minor in Mathematics at McDaniel College. I plan on pursuing a career in the Science, Technology, Engineering and Math (STEM) field, but my passion is to teach. For three years, I have served as a volunteer at Terra Cafe's: Neighbors Without Walls, as an advocate and service provider for Baltimore's homeless community. I am really excited to work with you all this summer! My name is Kathryn Dixon. I am a rising Sophomore at McDaniel College. I am on McDaniel’s Women’s Soccer team. I am excited to be a counselor this year after attending Summer Science Academy when I was in high school! I am a biology major and have always loved science. This past year I spent my jan term in the Bahamas studying Marine Biology with McDaniel students and professors! I love to travel and experience new adventures. When I’m not doing school or soccer related activities I love to watch Grey’s Anatomy, listen to music, and drink Dunkin’ Donuts Carmel Iced Coffee. Hi! My name is and I am a rising Sophomore here at McDaniel. I intend to major in Psychology with a minor in American Sign Language. I am on the women’s soccer team and I play intramural basketball and volleyball in the offseason. This past Jan Term I spent two weeks in the Bahamas studying tropical marine biology and it was a blast! I attended SSA Forensic Science camp in 2016 and I am excited to be a part of SSA this summer as a counselor. I can’t wait to share my love for science with you all! When I am not practicing or studying I enjoy reading, watching Shameless, or going on adventures with friends. My name is Laurel Holmes. 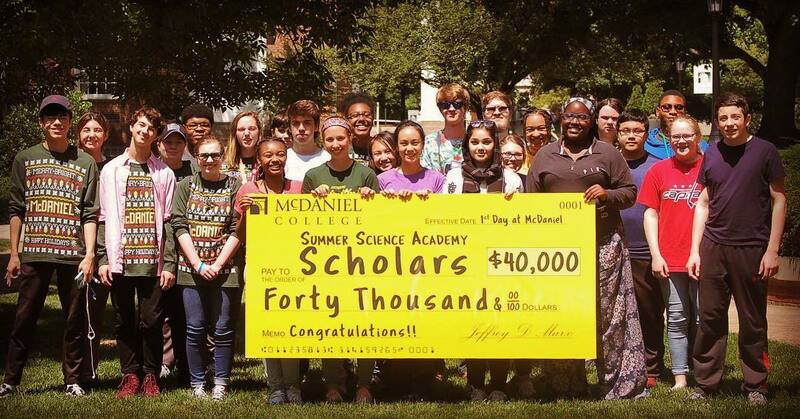 I am a rising Junior at McDaniel College. I attended the SSA my junior and senior year of high school and am excited to return as a counselor this year. I have traveled to the Bahamas to study Marine Biology as a Jan term course and have a passion for photography. My name is Kayla Stout. I am a rising Junior at McDaniel College. I have been through the Summer Science Academy twice as a student and am excited to now be a counselor! During the semester, I am a member of the National Honor Society, Alpha Lambda Delta, and am also a member of the Phi Mu sorority. I am majoring in Psychology and minoring in Biology with aspirations to become a Physician’s assistant. I look forward to another great summer with SSA.